IF beleagured Hull FC fans are searching for any solace this morning at least they can take comfort from the fact this was not as bad as last time they faced Warrington Wolves. It was in August when Lee Radford’s humiliated side were on the end of an 80-10 mauling at Halliwell Jones Stadium so this resembled progress of sorts. At half-time of another utterly one-sided affair last night, the score stood at 34-6, just as it did seven months ago. 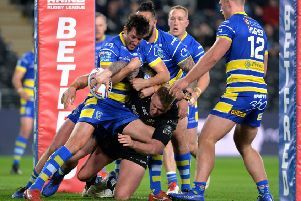 Thankfully, rampant Warrington were not quite as ruthless - and Hull not quite as bad - in the second period but it was all pure damage limitation. Admittedly, the East Yorkshire club were missing a few key players, notably Gareth Ellis, and had to play utility forward Jordan Thompson at centre. But, after winning four of their last five games, there was no excuse for this ineptitude. 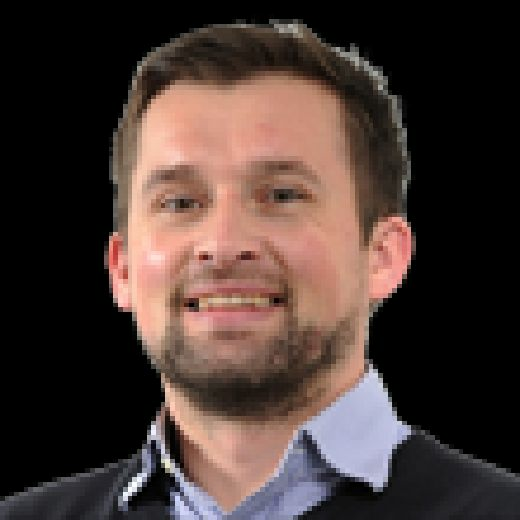 As four-try Blake Austin ran riot, Josh Charnley also celebrating his England recall with a hat-trick in an 11-try romp, it was a stark reminder of just how far they are away from being genuine Super League contenders. During a farcical - or brilliant, depending on your persuasion - 14 minute spell in the first half, Warrington secured six unanswered tries to surge 28-0 ahead. Marquee signing Austin, given all the time in the world to parade his skills, must have wondered if this really was Super League or some sort of bizarre joke set-up. The Australian stand-off is clearly some player and - dare I say it - he could be the one who finally makes the difference to see Warrington lift that elusive first league title since 1955. However, it was alarming how often the shambolic Hull defence was fooled by his repeated dummy trick, stood off him to let him run at them and invited him in to torment them. Granted, his first try was impressive, shooting on to Chris Hill’s flat pass at pace, surging out of Marc Sneyd’s tackle and then twisting through Hakim Miloudi to stretch over. Austin suffered a cut head in the aftermath as Scott Taylor tried a last desperate attempt to stop him but even with a heavily bandaged head the hosts still failed to spot him time after time. 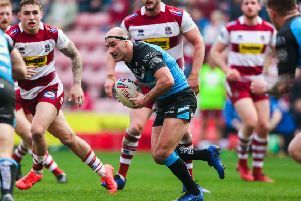 French full-back Miloudi had won of those hapless evenings which, unfortunately, are more common than the good ones whenever he gets a chance to stand-in for Hull’s Jamie Shaul. As well as being defensively brittle, he spilled a high kick to give Warrington position for their second try. Jake Mamo was initially denied by some rare rearguard action only for Daryl Clark to comfortably sell a dummy on the last tackle and dart over from 10m out. In the next set, England prop Hill continued his audition to be Austin’s half-back partner, this time slipping a lovely inside pass for Stefan Ratchford to breeze clear into space. Hull recovered briefly but Austin decided to match Clark’s dummy and raise it even higher with an outrageous effort that saw Hull’s defence split for his second. Playing like Lee Crooks in his pomp (what must the Black and Whites legend have thought about this debacle? ), Hill dug further into his repertoire by pulling out a classy offload for Charnley to get the first of his hat-trick. With such pace, verve and confident execution across their entire side, Warrington looked worlds apart. Josh Griffin immediately gifted Charnley his second try, though, when badly fumbling Austin’s kick, Ratchford making it 28-0 after just 21 minutes. You had to pity him, especially considering it was his first first-grade game since 2017 having ruptured his ACL during a warm-up match for the Brisbane last year. At that point, his new side had still yet to get in Warrington’s 20 with ball in hand. They did, finally, in the 26th minute but Mark Minchiello spilled trying to play the ball near the visitors’ line. It was exhausting. Normal order some resumed. Austin completed his hat-trick six minute later, barely getting out of second gear again as he broke from halfway and dummied past an embarrassed Miloudi. Steve Price’s side finally erred themselves when Charnley spilled a kick and Albert Kelly eventually barged his way over three minutes before the break, Sneyd improving. However, there was never any chance of a comeback; Warrington almost let a 26-6 lead slip in their last outing at Wakefield Trinity so they were always going to be on their guard here. Indeed, Ben Murdoch-Masila charged through more woeful defence after just 55 seconds of the second period, Austin sliced through for his fourth and Tom Lineham got his first when he had no right to given four players had him marked in the corner. Jordan Lane got one back for Hull but former FC winger Lineham added his second with an 80m intercept and Austin, cheekily, added a drop-goal in the penultimate minute. Hull FC: Miloudi; Faraimo, Tuimavave, Thompson, Griffin; Kelly, Sneyd; Paea, Houghton, Taylor, Minichiello, Manu, Westerman. Substitutes: Hadley, Matongo, Lane, Savelio. Warrington Wolves: Ratchford; Lineham, King, Mamo, Charnley; Austin, Patton; Hill, D Clark, Cooper, Currie, Hughes, Philbin. Substitutes: J Clark, Tasi, Murdoch-Masila, Livett.